Today has been my most depressing day after one year of working in Sarawak Hospital as an intern. I am currently in Pediatric Department (child), Sarawak General Hospital (SGH). On 3/10/2009, there was 1 family, attacked by a swarm of hornet/wasp bee at Batu kawa, Kuching. A total of 6, mother, 4 children and one cousin were attacked by the bees. 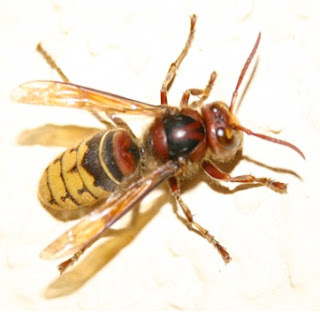 Upon admission to the ward, 2 of the children were badly stung by the hornets, although adequate resuscitation has been performed, they died on the night of admission(3/10/2009). They were only 6 years and 3 years old, died most likely due to anaphylatic shock. From the history, during the attack, the mother tried to protect the children by hugging them and let the bee attack her back, and true enough, most of the bee stung appearead on the mother's back. Mother was admitted to medical ward, and was later transfered to Intensive care Unit(ICU) as the condition deteriorates overnight. Currently the mother was still in critical situation when I left the hospital today. The other 8-year-old girl, although she was not badly stung compared to her siblings, however, this morning she developed shortness of breath and required mechanical ventilation. She is currently in critical situation too. When I faced the father this morning, I felt so upset, and I don't know how to describe my feelings. The father was not around when the attack happened and hence was not attacked by the hornets, but I knew deep in his heart....that he would want the hornet to attack him 10 times 100 times...or even 1000 times more rather than attacking his children and his wife. Tears were in my eyes when I was doing round this morning. He witnessed one by one, the children passed away in front of him, and his wife and the 8-year-old girl has not gone through the critical period yet. i have been stung by a hornet 25 years ago and the scar still visible on my hand until now.